Made in a steel drum, lined with ceramic fibres held on by wires and clay buttons. Lid has a vent and arms for lifting. 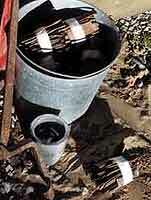 Gas fired using a Propane tank. Pouring area has sand floor. 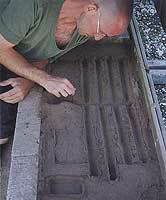 Holger preparing ingot moulds in sand. 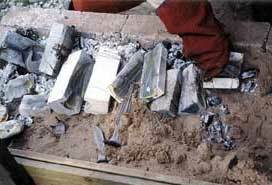 Measured bundles ready for the melt. When the noise from furnace has become a steady foreground roar two or three women squat in position around pits, they are moving sand and moulds. 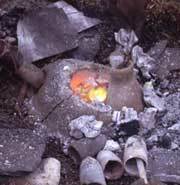 There is one glowing charcoal pit laden with clay moulds and one smooth sand bed raked and ready. 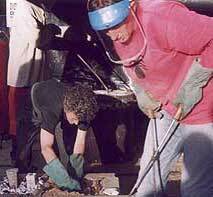 One Squatter is in charge of removing hot moulds from the hot pit with tongs, another prepares the sand and, hand in glove, accepts and positions the moulds. 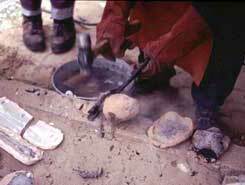 Meanwhile the third Squatter builds up sand around their bases.Hot charcoals are removed with tongs from the charcoal pit and placed around the upright moulds like smouldering embers of a post apocalyptic city. 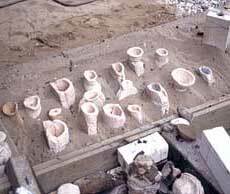 Pourers survey the pits and design choreography for The Pour by establishing the order of the moulds. 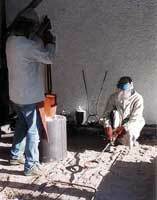 Hottest matter must go into the most complex mould. Pourers spend moments perched by the roaring metal drum, angling body and craning neck to peer, bird-eyed into the blinding vent of the furnace. 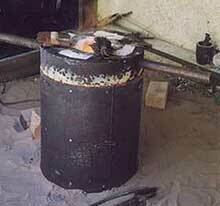 When the metal is moulten and has a mirror surface, the hiss of gas is shut off to silence. 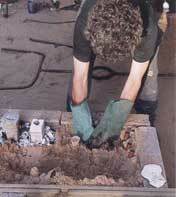 The furnace lid is lifted by the Pourers and placed to the ground. 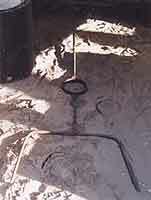 The 'Steady Pourer' takes up position at the single tine of the pouring fork and raises this end slighty from the ground to form an angled "O" to safely hold the crucible. Red and glowing the crucible is removed from the silent interior of the hot furnace. 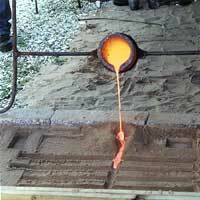 Using large vertical tongs, the Lead Pourer places the radiant crucible into the angled pouring fork. 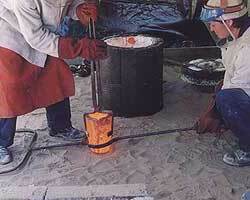 The two Pourers lift the fork horizontal together, the hot crucible glows between them. Lead Pourer controls movement, Steady Pourer follows, making no independant moves. 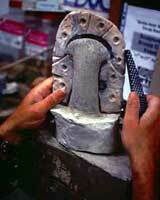 A Scraper is in place to remove slack from surface of the moulten bronze. 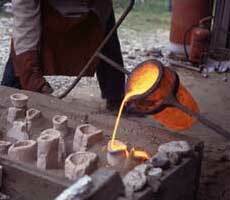 The metal flows liquid light, from crucible to mould, mirror flashes glancing the surface. Moulds drink metal, some surrender as liquid runs out through seams, others spit and gag, most accept, like greedy cuckoos, metal turning solid in their bellies. 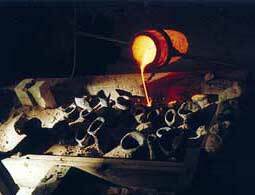 The Scraper minds the crucible lip, keeping it clean for even pours and, when metal runs solid will remove 'marmalade' of congealing matter from the cooling surface of the empty vessel. The moulds digest, liquid becomes solid. 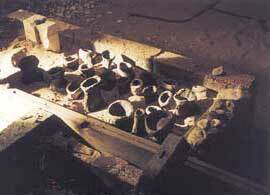 After The Pour, tied stone moulds' wires are snipped immediately and casts are released. 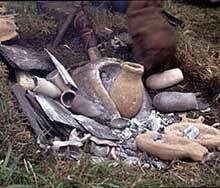 Clay moulds are placed sizzling into a bucket of cold water which is quickly brought to boil and an offer of tea is casually made. 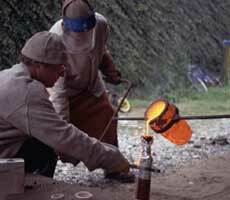 Warm clay flasks are lifted out and prised apart, more or less gently tapped with a hammer, metal is eased out as spectators move closer to survey the booty. Dymphna, who loves her flashing and who rarely 'finishes' her pieces, made a mysterious figure, carved from a small branch with one arm and flying head gear, this was placed in a clay mould made like a book with two flat pages and tied together with wire. On the last day she emmerged from The Pour like an Egyptian divinity held within the lacy filigree of elaborate flashing as if she was walking out of the pages of an ancient manuscript. James, who had been experimenting with lost wax and core making techniques, made some exquisite spheres, tiny with blackened cores, one had spaces carved into it like lost continents, they looked like planets from St Exuprey's "Little Prince". 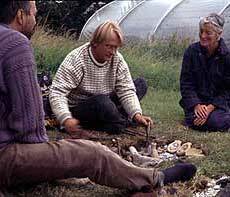 Holger, had concocted various recipes using organic matter resembling oatcakes or muesli which seemed more at home on the breakfast table than the foundry, (that is until they grew hairs and turned into gremlins!) 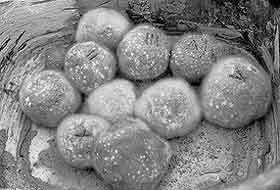 This collection of muesli balls were carefully numbered and tested for success as cores for some excquisite lost wax busts, the size of a fist. 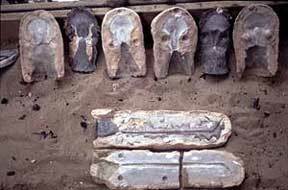 Even the moulds for these pieces were beautifully formed organic flask shapes, genies' bottles, holding a form which was struggling to be released. Niall, apart from being the Bronze Consultant made a clay mould for an axe head, using Fiona's technique which he said was 'like modelling in air', the core for his axe was an amazing object hairy, organic and perfectly formed. The resulting bronze appealled to me in its incompleteness of form but not I think to his perfectionist self. Padhraic made a perfect spearhead, dynamic as he, Maire the master mould maker had a great success rate in brooches from bronze age design and a mysterious obect (...) that is believed to have been for ceremonial use, a (heavy) bauble which may have been attatched in number to clothing to transform the wearer to appear as a many breasted figure (Ephesus) Cliona made a magical mirror, the mould carved from stone that she brought, Anders had no great success with the moulds he brought but his attention was focussed on the building of a Neolithic Furnace, which uses updraught and was magnificent, reaching temperature and forming liquid bronze even in the low atmospheric pressure conditions of the final day, he also made successful experiments in glass in his pit furnace. 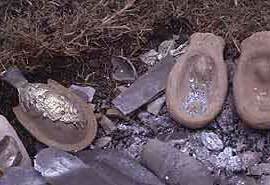 There were other successes from the islanders; John Mc Curdy's little bronze boat, Jennifer's axehead, Brian's ornately carved objects, one mould made in sandwiched sections to produce multiple pieces, Jonathan's axe head made with a spectacular "nose" mould where the liquid bronze helter skeltered the pouring hole and slid into place and bulged out the "eye" holes, amazingly cooling to form a plug before seepage could occur. Paddy's spear head, Penny's bronze bowl, (another breast form), Eilis's little boat from a 2 piece stone carved mould, visitor's made a little lizard in the most amazing donkey dung mould with wax twigs for spru holes bristling out of the top and a perfectly fleshy tiny frog from wax. Resident silversmith Johnny Fyffe made a spear head modelled on three that he found during an architectural salvage (and which is the basis for a contoversial thesis he has written about bronze age lost wax technique) and presented it to Niall complete with haft and feathers! My own favourite piece was from a small thread of seaweed I found, already twisted to torc shape which I pressmoulded in clay. The mould produced flashing and the fired stoneware became integrated with the object, a curious piece (that didn't want to become worn), to remind me of the strand where the islanders used to collect kelp for iodine in exchange for rent. Julie Forrester, Cordula Hansen, Irene Benner, Bernd Hansen, Parra Ó Síocháin, Marie Ní Gabhann, Eilis O'Baoill, Anders Söderberg, Fiona Coffey, Pádraig McGoran, Holger Lönze, Cliodna Cussen, Dympna Molloy, Niall O'Neill, and James Hayes. The Rathlin Island Co-operative Society Ltd., The Arts Council of Northern Ireland, Foras na Gaeilge, BOC Gases, Bronze Art Ltd., Cast Ltd., Coldec, P.J. Dix, Isaac Mullen Ltd., Fordham Thermal Systems, James Murphy & Son, RPM, Scarva Pottery Supplies Ltd., Silica Sand Co., and Weldtech.